This is a delicious and tasty Moroccan recipe that's easy to prepare. This recipe doesn't call for any "exotic" spices, but it delivers an exotic flavor. 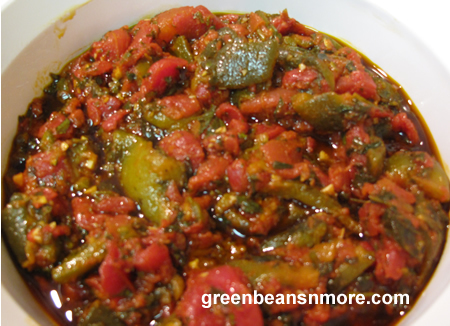 The base of this recipe is cooked tomatoes and roasted green peppers. If you haven't roasted peppers before you're in for a treat. Roasting a pepper is a very simple thing to do and we have included "how to roast a pepper" below. This is another perfect make-ahead appetizer. It's best the next day, served room temperature with lots of crusty bread for dipping. Make is part of a Middle Eastern Meze. Mix all the ingredients in a large frying pan and cook over medium to medium-high heat, stirring occasionally, until the tomatoes are very soft. Turn the heat down, if necessary, to allow the tomatoes and peppers to simmer. Allow the mixture to simmer, stirring occasionally, until the liquids are reduced to oil. Serve this Taktouka salad warm or cold with crusty bread for dipping. Cooks Tips: Unless it's summertime it's impossible to find a decent tomato. Several years ago I started using canned whole tomatoes in my recipes. This guarantees you better flavor, an overall better outcome and saves you money. Drain the tomatoes, remove the seeds and prepare them as you would the fresh. How to roast a pepper: Preheat the oven to 375 degrees. Place the green pepper(s) on a cookie sheet that has been covered with aluminum foil. Place the peppers in the oven and check every 15 or so minutes. Using tongs rotate the peppers so they cook evenly. The skin will blister and turn brown. This process will take approximately one hour. Let the peppers cool 15-20 minutes before removing the skin. Hold one end of the pepper and gently peel the skin off the pepper. The skin should slide off fairly easily. Slit open the side of the pepper and spread it out (ribbed side up) on your work surface. Remove any seeds. Scrape off any of the ribs or membrane that remains in the pepper.